It is said that things can be better understood through examples, or references. In many instances we have to come across with situations when we need to refer multiple sites of same kind to gather information, or to perform any kind of research. Similarto.us is a great site for similar actions. 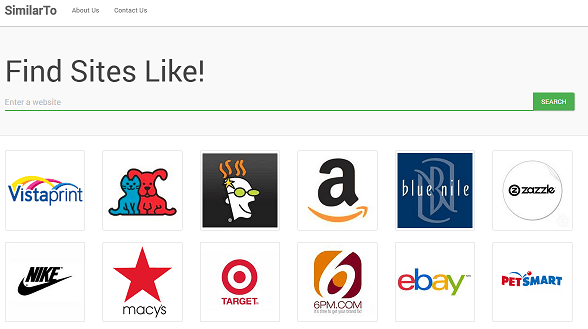 It acts basically like a search platform for finding out equivalent sites. They make you available with equivalent sites by having constant dig at search engines, and then they arrange sites in accordance with various aspects. These are ranked and presented in terms of their match level. The process is quite simple; you just need to type the site name over the search panel. Equivalence level of a site to any particular is judged by its match score. It makes you available with precise information about each matching site as well. For more advanced result you can go for searching in terms of that particular category as well. Through the process you can be more ensured about the sites those match your preference. You just type in the niche of your interest over the search panel. A stack of equivalent sites appears. It is having a great interface that makes it a perfectly user friendly platform. The distinguishing part is its categorisation that is quite difficult to find at any other option. The categorisation saves much of your precious time. You can make search being specific about a brand as well. For example you search for iPhone, and a list of sites talking about or giving information about iPhone appears.